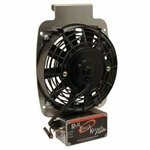 Ruff Land Kennel Fan and Accessories. The heavy-duty Ruff Land Dog Crate Fan gives you two fan speeds at the flip of a switch for maximum cooling for your dog, or for minimal power draw to conserve your battery. Field tested to withstand weather and vehicle vibration. Connect to your vehicle's 12-volt cigarette lighter plug, or to your trailer hitch power connector with one of the available adapter cables.